Energy analysts in Washington are warning voters that a state ballot measure placing a tax on carbon emissions will likely cause gas prices to skyrocket at a time when oil prices are expected to increase. A carbon fee would pitch gas prices above 14 cents a gallon, the Western States Petroleum Association said in a press statement Sunday. The association was addressing measure 1631, which would make Washington the first state in the country to enact a tax on carbon emissions. “Climate change should be addressed at national and international levels” and that state-level policy “would have a negative impact on our state’s businesses,” the association noted in a press statement, which also noted that such measures would have a negligible effect on the climate. Spending on the measure has exploded recently. One of the coalitions pushing the issue raised nearly $14.8 million, including $1 million from former New York Mayor Michael Bloomberg, who has donated upward of $20 million in House campaign ads in the final week before midterm elections. Big oil companies belonging to the Western States Petroleum Association, meanwhile, have plowed $26 million, according to Washington’s Public Disclosure Commission. The measure marks the most recent activist-led campaign to impose carbon taxes in the state. Gov. 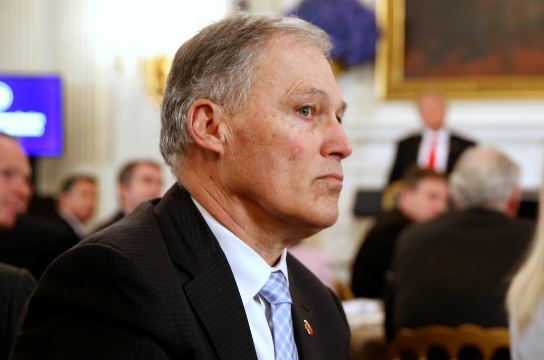 Jay Inslee and state Sen. Reuven Carlyle, both Democrats, admitted in early March, for instance, that they didn’t have the votes to pass a carbon tax. Inslee’s plan would have taxed emissions at $12 a ton, increasing $2 a year above inflation. The bill was projected to raise $766 million, which would be spent on green energy programs, forest management and other programs. Some of the funds would have been used to offset higher energy costs for poor families. Washington has a storied history of involving itself in various anti-oil schemes. One of the sates largest counties – King County – for instance filed a lawsuit in May targeting Exxon and several other oil companies for supposedly contributing to the effects of climate change. The suit, which was brought by Seattle-based law firm Hagens Berman Sobol Shapiro, seeks to create an abatement fund addressing changes to infrastructure, like bridge maintenance, salmon recovery and public health.